Whether you are new to fishing or are looking to replace an old favorite, choosing the best spincast reel might seem like a bit of a daunting task. 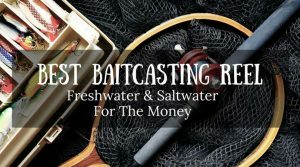 Luckily, there are plenty of them to choose from – some with better features than others, some that are perfect for those just starting out, and others that are great for avid fishers who are looking to replace or upgrade their old fishing reel. 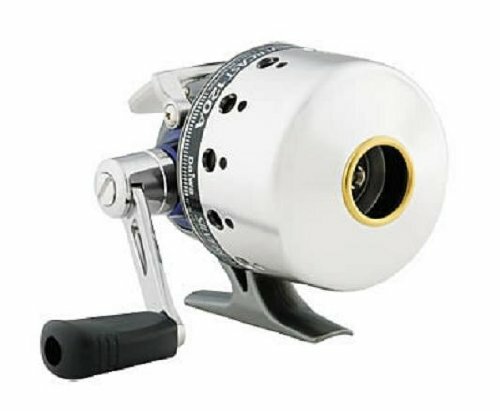 Since choosing the best spincast reel for you might be difficult, as there are a variety of different reels made from different materials, different sizes, those that have different weights, and that are used for the best type of fishing, you can get a good idea of what you might be looking for by reading on. 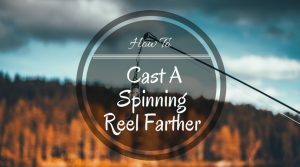 ​When to Use a Spincast Reel? 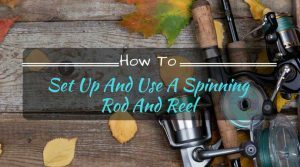 If you have already made the decision to use a spinning reel, or if you are still on the fence and are looking for some reasons to pick up a spinning reel for your fishing, there are some things you might be wondering about. For example, when is the best time to use a spincast reel? A spincast reel was designed with the idea that they could help reduce some of the tangling and broken line problems that came with the baitcast reel. Spincast reels are very versatile reels that can be used for a variety of different types of fishing. Whether you are a beginner who is seriously looking into fishing and wants something easier to start with, or if you are a seasoned pro who still wants a durable reel that works for all types of fishing, a spincast reel is a great bet for you and is sure to help you achieve your fishing goals. ​One of the most appealing features of the spincast reel is the fact that, unlike the baitcasting reel, you are able to get a tangle and mess free cast each and every time. 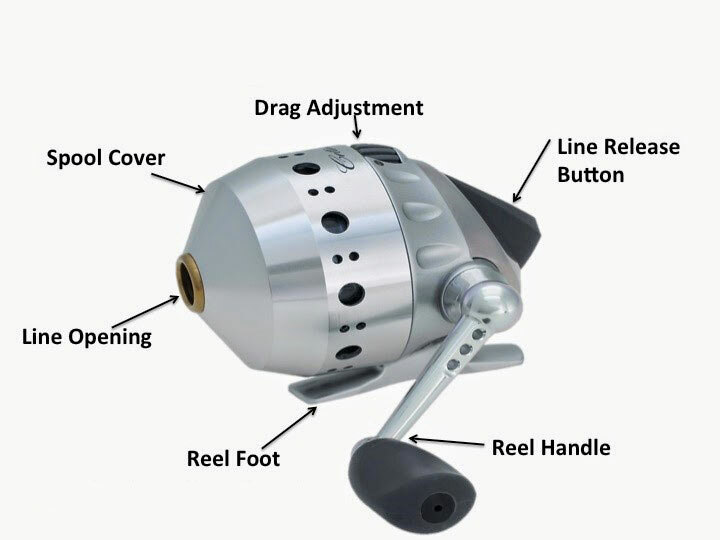 The spincast reel works by using a button style casting, so you don’t need to be proficient with a baitcasting reel (such as having a complete understanding of how the braking systems on those types of reels work) in order to use it. That means more time spent fishing and less time spent on practice casting, since learning to use a baitcasting reel can take up to an entire fishing season’s worth of practice to really get a grasp on the mechanics. The fact that it has a sort of button for casting allows you to get mess free, long range casts. 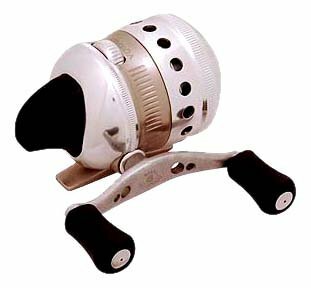 Although not always as accurate as a baitcasting reel, the spin casting reel is a great starting point or reel to use for all around style fishing. Spincast reels are also great choices if you have a limited budget, as they tend to cost less that most baitcasting reels. By paying special attention to these factors, you will get exactly what you are looking for in a fishing reel without any hidden surprises or disappointments once you get it out on the water. There are two different types of spincast reels – push button spincast reels and trigger-equipped spincast reels. Push button spincast reels are used with a baitcasting rod and have a button that is easy to press on the top of the fishing reel. A trigger equipped fishing reel, on the other hand, is also called a underspin or triggerspin reel, and is made to be combined with a spinning rod. These sit under the rod and work like a spinning reel. 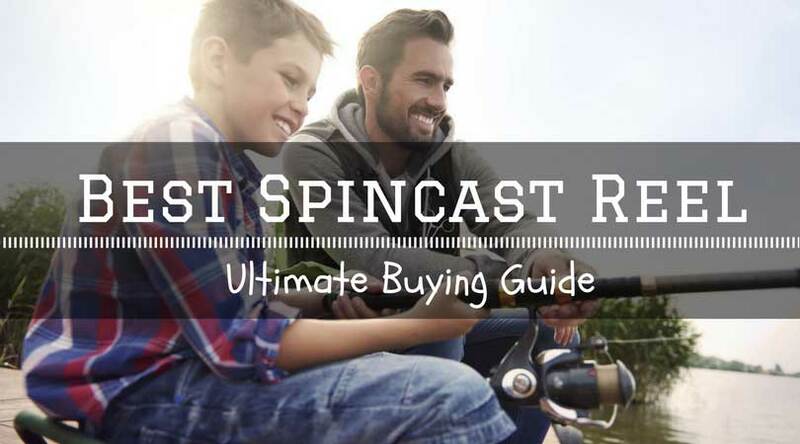 Both types of spincast reels are affordable and easier to use than a spinning reel or a baitcasting reel, making them ideal for children, novices, and experts alike. When choosing a spincast reel, it is important to take construction into consideration. Since the majority of components are inside the cone shaped housing of the spincast reel, you want to make sure that the outside is durable and can stand up to years of use. Different materials also have different weights – for example, most aluminum reels tend to be a lighter weight, allowing you to fish for longer periods of time without becoming fatigued. Other spincast reels are made with carbon or graphite, which also tends to be lightweight and can stand up to the elements well. Often you will see these reels as being “corrosion resistant,” which means it will resist rust. When choosing your spincast reel, it is important to note that when a reel has more than one take-up pin, it can help you retrieve the line more quickly. The more take-up pins in the reel, the quicker you will be able to reel in your line. With a reel that only has a single take-up pin, it might give a bit of a delay until the line is caught, which will begin reeling in the line. 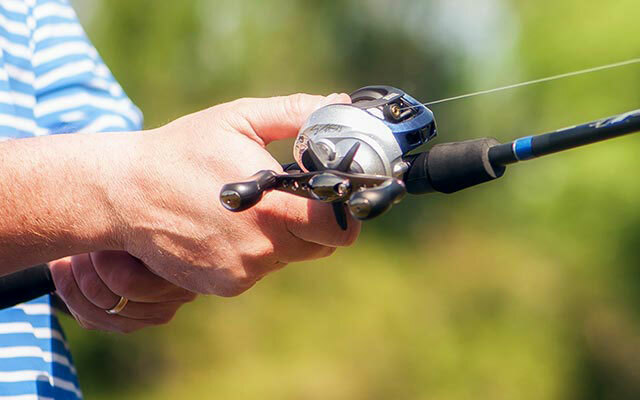 In either case, it will be important to keep tension on the line while reeling in, whether or not you have a single take-up pin in your reel or multiple take-up pins. Spincast reels have either one of two drag systems. 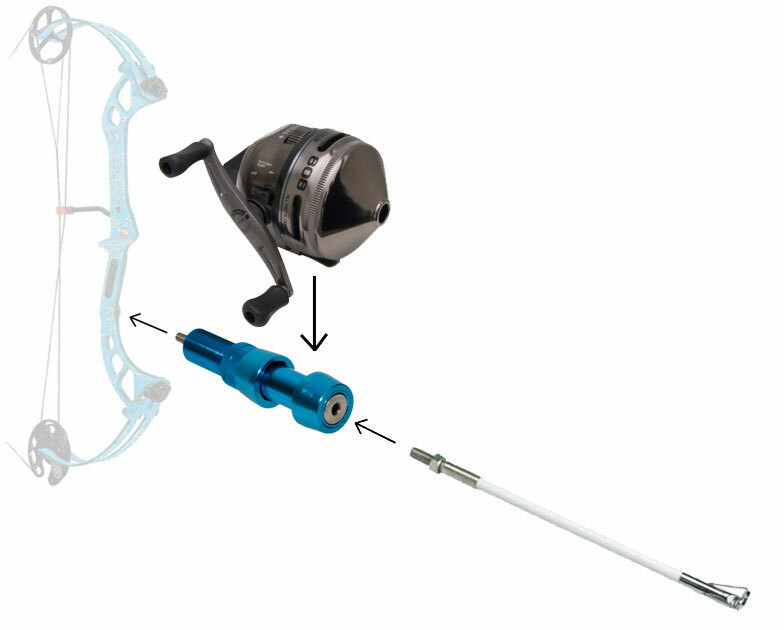 The first type of drag system: which is the star drag system, is mounted on the outside of the fishing reel, between the handle of the reel and the reel body. It is a large system and is very easy to operate. The second type of drag system: which is the internal drag system. The internal drag system only has a small, grooved wheel on the outside of the reel, while the rest of it is inside the reel housing. Most of these wheels have a “+” and a “-” sign, which allow you to control more or less drag while retrieving. The gear ratio on a fishing reel explains how many revolutions the line makes around the spool per turn when reeling in. The gear ratio is expressed in numbers such as 6.3:1. The number in the first column (in this case, 6.3) tells how many times the line will wind around the spool, with the number in the second column (1) indicating the number of revolutions. So in the case of a gear ratio of 6.3:1, the line will wind around the spool 6.3 times per one revolution. If the gear ratio is lower, it means that the line will be retrieved more slowly than a higher gear ratio. When it comes to ball bearings, it’s easy to remember that more ball bearings tends to make for a smoother fishing experience when casting and reeling in the line. As with baitcasting reels, this is the same – the more, the better. Also, it is important to look for ball bearings that are shielded or have some form of anti-rust or anti-corrosion protection, especially if you plan on using the reel in saltwater. This will protect the ball bearings from becoming rusted or corroded, rendering it difficult, if not impossible, to use. Spincast reels tend to have a smaller line capacity than other reels, such as a baitcasting reel. Because of this, you won’t have quite as much line to work with when you are fishing. Most good spincasting reels will hold between eighty and one-hundred-twenty yards of fishing line, although this amount will vary if you use a different thickness or size. The spincast reel can also use a variety of lures, such as your favorite spinner baits, crank baits, and jigs. Lighter lures tend to work better on spincast reels, as the reel isn’t as powerful as a baitcasting reel. Anti-reverse handles on a spincast reel are as essential as an anti-reverse handle on another type of reel, such as a spinning reel. Simply put, this allows the reel to be “stopped” when a fish tries to swim the other way, thus pulling more line out than you are taking back in, causing the line to go in reverse. With an anti-reverse handle, you are able to switch it on or off depending on your situation. The ease of an anti-reverse handle allows you to be more confident in your fishing. Like a baitcaster or spinning reel, a spincast reel has a spool that winds the fishing line. Unlike a baitcaster or spinning reel, however, the spool of the spincast reel is completely enclosed in the reel’s housing. This allows the spool to no only be protected, but also allows it flow more smoothly without having to worry too much about a tangle in the line, or the dreaded “bird’s nest” tie ups that occur with other fishing reels, such as the baitcaster reel. With all of the different spincast reels available on the market, it might seem like a daunting task to choose one that will work best for you and your fishing style. Here we are going to talk about four of the best spincast reels of 2017, and give a brief introduction to them, go over their features, and why each one is a definite gem in such a crowded market. Zebco, a top selling company of the spincast reel (as well as the company who invented it), is one of the most trusted companies when it comes to spincast reels. The Zebco Omega ZO3PRO Spincast Fishing Reel is also the company’s most advanced spincast reel, giving you the most rewarding fishing experience that you could dream of when fishing with a spincast reel. 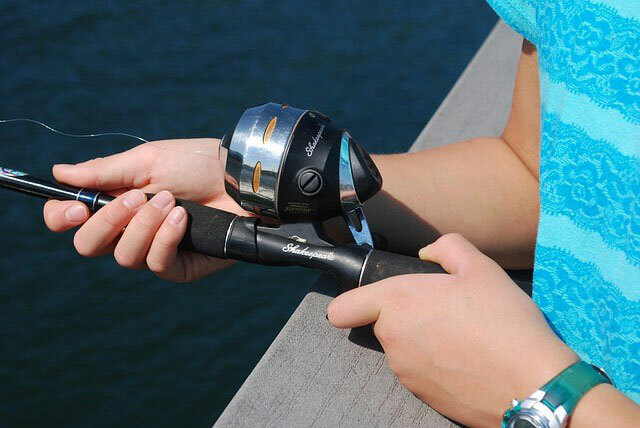 The reel has a gear ratio of 3.4:1, making it ideal for a relaxing fishing experience. Not only is it incredibly powerful and advanced, but this reel is also the first spincast reel to have seven bearings, giving you a smooth overall fishing experience. The handle, which is ergonomic and easy to grip, can also be adjusted for either left of right handed retrieve, and is perfect for fishers of all skill sets – from children to professionals. The triple-cam multi disc drag system on the reel allows you to have plenty of stopping power for even the largest fish. As far as construction goes, this reel is professional quality, with aircraft grade aluminum coverings, all metal gears, and a ceramic line guide. The oscillating spool and Auto Bait Alert, which will allow you to know when a fish bites by making a clicking sound, are helpful features for all fishing levels. This reel is designed to be used primarily in freshwater, but can also be used in saltwater as long as it is properly cleaned afterward. This easy to use reel makes fishing simple and more enjoyable. If you are looking for a high quality fishing reel from a reputable brand name that you can trust, the Pfleuger President Spincast Reel is a great choice. 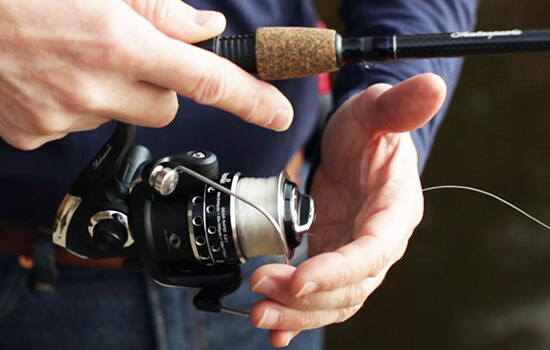 With plenty of favorite features that work for fishers of any experience level, this is a reel that makes for quick learning and a lot of fun using. With an attractive reel body that is made from a rigid aluminum, making it lightweight and easy to use, you can be sure that this freshwater fishing reel is going to be a favorite. 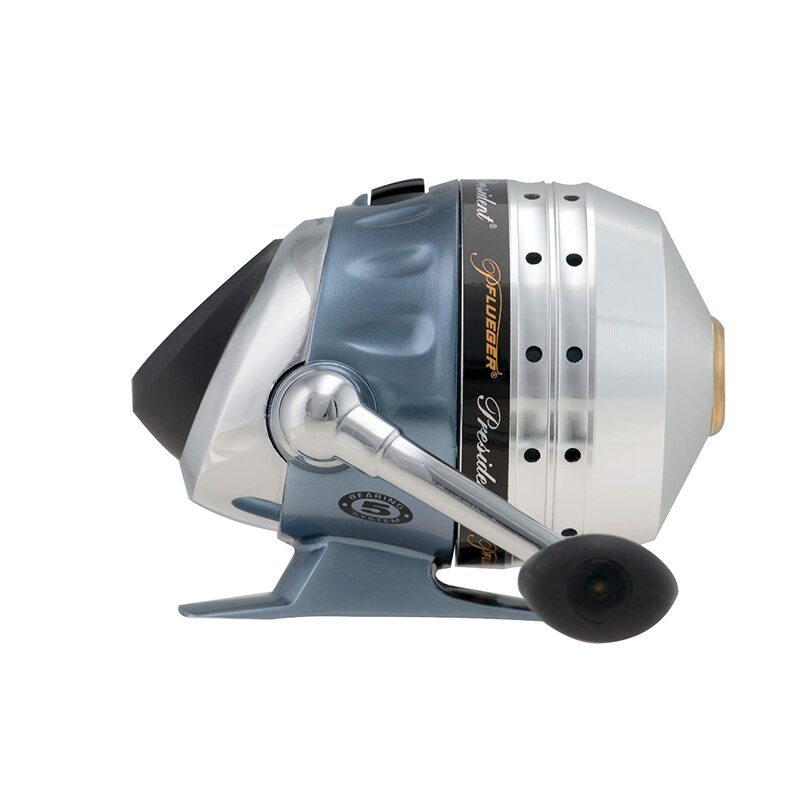 Complete with an aluminum handle with a soft touch knob, four ball bearings, and an instant anti-reverse bearing, this reel has an easily adjustable drag to make your fishing experience completely custom. The front cone on the reel body is made from ported aluminum as well. While this is designed for freshwater use, it can be used in saltwater as long as proper care is taken to clean the reel and prevent corrosion. The reel has a 3.8:1 gear ratio, and comes pre-spooled with a 10lb line. It is easy to change the spools and the line on this reel, making it ideal for beginners who are just getting started with fishing reels. 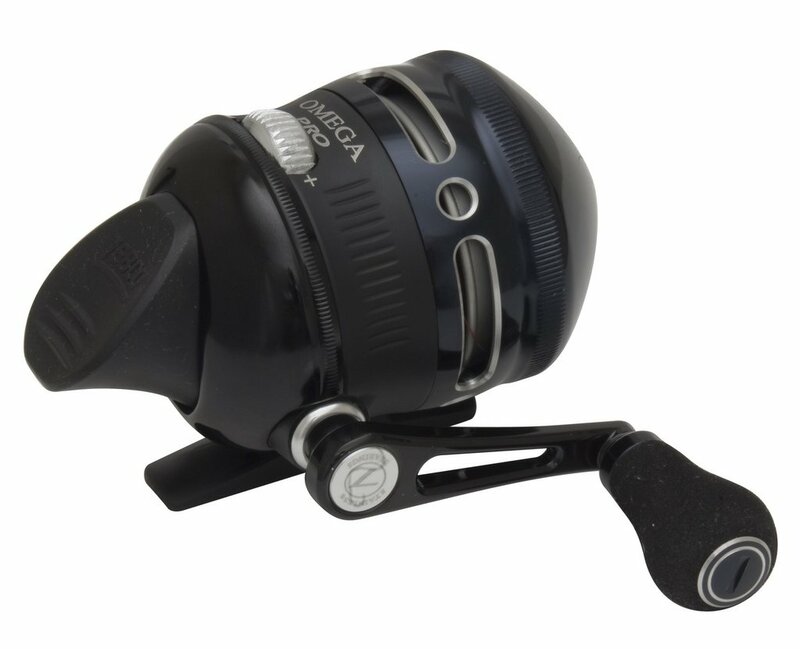 Another high quality spincast reel from the inventors of the original spincast reel, the Zebco Omega Z03 Spincast Reel has a 2.9:1 gear ratio and comes with a whopping seven ball bearings to make your entire fishing experience smooth and enjoyable. 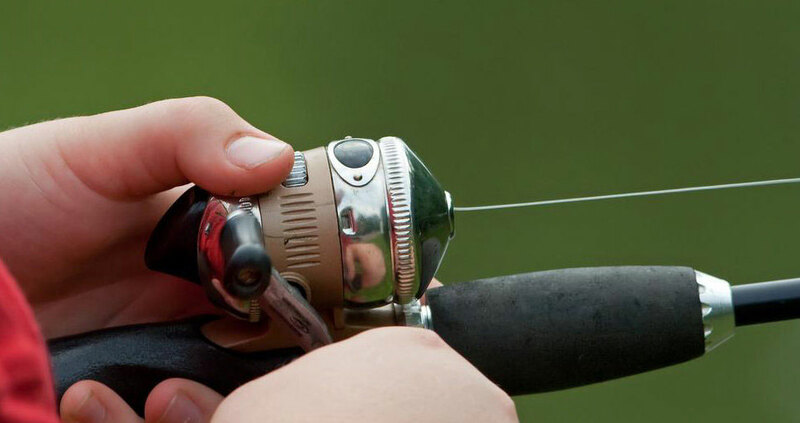 A favorite feature on this reel is the soft touch thumb button; as opposed to being a hard plastic that gets slippery when wet, the soft touch button features a rubber design that is sealed and will allow you to easily cast and reel in, even if the reel itself gets wet while you are fishing. The ball bearings in the reel are made from stainless steel, making this reel perfect for freshwater, and easily adaptable to saltwater, as long as you properly clean the reel after each use. Constructed from aircraft grade aluminum, this reel is sure to hold up to the toughest fishing time and time again, becoming one of the more reliable pieces of fishing equipment that you turn to. With a level wind oscillating spool, a triple-cam multi-disc drag, and a ceramic line and pickup pins, you have a great deal of power in your hands when you choose this reel. The reel also has a continuous anti-reverse system and a 3X Positive line pickup. While the all metal construction might be a bit more on the heavy side than other reels, it makes up for it in terms of power and long-lasting parts that you will turn to again and again. The Daiwa Silvercast-A Series Spincast Reel is a simple and easy to use spincast reel that packs plenty of power that is perfect for light or medium fishing action in fresh water environments. With a shiny white finish, authentic bone handle scales, and a soft touch handle, this reel is an attractive piece of fishing equipment that is perfect for new fishers and experienced fishers alike. The reel has three ball bearings, and is available in a variety of sizes: 80, 100, 120, and 170. The gear ratio on this reel is 4.3:1, giving you a decent retrieval power when reeling in a fish. The reel features a rotating, titanium nitride line pickup, which turns and helps to pick up the line for an easy and smooth feed each and every time. The disc drag has a dial adjustment on the reel housing, allowing you to choose how strong you want the drag to be for a variety of different fishing purposes. 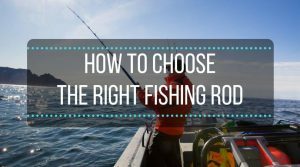 For catching smaller fish, with lower weights, this is an ideal rod to choose. The gears inside the reel are made from an aluminum alloy, and there is a spot to switch the anti-reverse feature on or off, which is helpful if you don’t want to allow your catch to pull the line in the opposite direction. With a lightweight aluminum construction, this is sure to become a favorite reel in no time at all! When you are looking for a new fishing reel, or if you are new to fishing and want to start with an easy to use reel that will be reliable and allow you to enjoy yourself without worrying too much about the mechanics, the spincast reel is a great starting point. While spincast reels might not offer the accuracy and control that other reels, such as a baitcasting reel, might offer, they can be fantastic tools that are easy to use and always ready to go. Spincast reels are ideal for those who are new to fishing, pros who are looking for a bit more relaxation, and even children who are just starting out. While some of those reels are great for saltwater use, some of them are strictly freshwater only, and others can be used for both freshwater and saltwater. 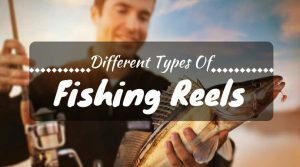 Before purchasing your reel, consider the topics discussed above, such as ball bearings, gear ratio, and construction – some of them may be more important to you than others. Perhaps you are looking for a reel that is lightweight, and are willing to sacrifice a few features in order to get what you are looking for – make sure to do plenty of research. If you need a great place to start looking, the recommended fishing reels above are top spincasting reels for 2017, and offer plenty of features and great functionality. 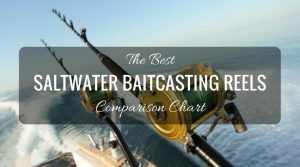 I have read several websites to find out the best spincast reel. Among this website, I have found the best review on spincast reel to your site. Thanks for your great article.